What is the Middle Georgia Regional Commission (MGRC)? The Middle Georgia Regional Commission is a regional planning and development agency serving the communities of Central Georgia since 1965. The MGRC provides technical assistance to the local governments of the twenty cities and eleven counties located in Middle Georgia. Professional services are provided in the areas of planning, economic development, public administration, information technology, and elderly services. Are there other Regional Commissions in the State? There are 12 Regional Commissions in the state, including the Atlanta Regional Commission (ARC). Every local government in the state is located within the service boundary of a Regional Commission. Although Regional Commissions operate and are governed independently from one another, they do provide common functions and services. Specifically, the powers, duties, obligations and immunities shared by all Regional Commissions are set forth in Section 50-8-2 et al of the Official Code of Georgia Annotated (O.C.G.A.). In addition, Regional Commissions provide different services from one another as dictated by their respective governing Councils. This is due in part to the diversity of planning and development needs found throughout the geographic regions in Georgia. Who governs and provides oversight to the MGRC? The MGRC is a regional planning and development organization that is self-governed by the local communities in Middle Georgia. 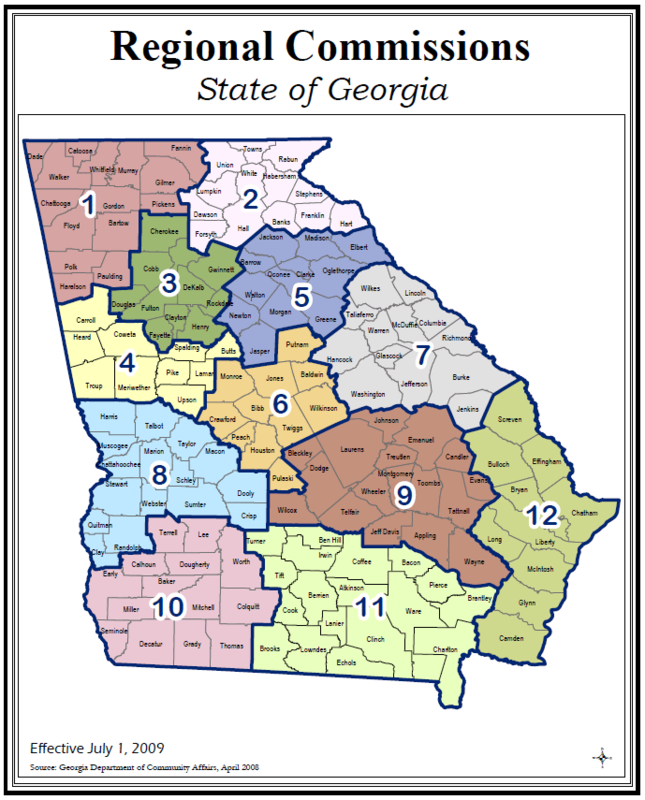 The MGRC has a regional governing council that is derived from a select group of local officials and private citizens from each of the counties and incorporated areas (cities) in Middle Georgia. Also, the Governor, Lt. Governor and Speaker of the House each appoint council members from the service region to serve on the governing council. This Council is responsible for establishing MGRC bylaws, making rules and regulations, setting policy and providing general oversight to the MGRC. In sum, the MGRC is governed by the very communities it serves. In addition to the governing council, the MGRC receives specific oversight from other agencies regarding non-local work program elements. For example, if a grant or contract is awarded to the MGRC from a state or federal source, the MGRC is required to follow the requisite standards and guidelines put forth by the funding agency. Therefore, various audits and other requests for information are a routine part of the MGRC work program. What is the composition of the MGRC governing Council? The Chairperson of the Board of Commissioners for each member county served by this Regional Commission shall be the County Council Member unless he or she declines to serve in which event the Chairperson of the County Commission shall select another of the County Commission members to serve in his or her stead. In the case of a consolidated government where there is no other municipality in the county, a second member of such consolidated government shall also be appointed by the consolidated government to the Council; term of office shall be concurrent with the term of elected office. The governing bodies of the municipalities located within each member county served by this Regional Commission shall collectively select one (1) elected mayor or councilperson to serve as the Municipal Council Member; provided, however, that the Municipal Council Member from Bibb County shall be the Mayor of the City of Macon or a member of Macon City Council selected by the Mayor; the term of office will be concurrent with the official’s term of elected office. The County Council Member and the Municipal Council Member for each member county served by this Regional Commission shall select one (1) resident of the county to serve as the Non-public (non-elected) member of the Council. The term of office will be one (1) year with the member being eligible for successive reappointment. 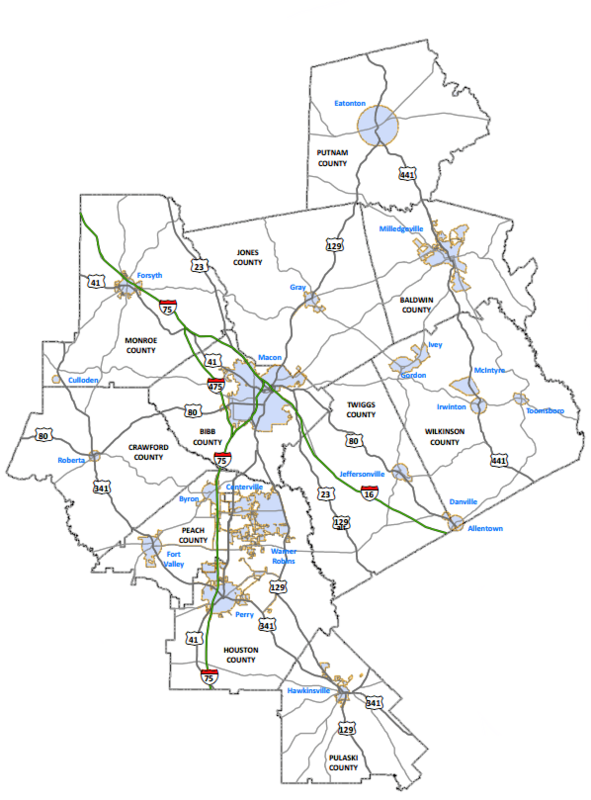 The County Council Member and the Municipal Council Member for each member county served by this Regional Commission shall select two (2) residents of the county to serve as Associate Members of the Council. The term of office will be one (1) year with members eligible for successive reappointment. One member of a school board or superintendent of schools within the region and two nonpublic residents of the region shall be appointed by the Governor, each for a term of two (2) years. One nonpublic resident of the region shall be appointed by the Lieutenant Governor for a term of two (2) years. One nonpublic resident of the region shall be appointed by the Speaker of the House for a term of two (2) years. Councilmember appointments and/or removals shall be accompanied by written notice to the Commission. What is the service region of the MGRC? 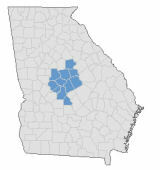 The service region of the Middle Georgia Regional Commission consists of twenty-two cities and eleven counties in Central Georgia. The MGRC service jurisdiction spans over 3,600 square miles and has a resident population of over 440,000 people. How is the MGRC funded? The MGRC is funded by state, federal and local government sources. On the local level, cities and counties located within the service region pay mandatory membership dues on a per capita basis to the MGRC. Membership dues help support the MGRC local technical assistance and provide matching resources for available state and federal grants. On the state level, the MGRC is funded by the following agencies: Community Affairs (DCA), Transportation (GDOT), Human Resources (DHR), and Natural Resources (DNR). State funds allow the MGRC to administer planning and development services. Other state agencies provide funds to the MGRC on an ad hoc basis as various contracts for services are executed or grant funds are awarded. On the federal level, funds are provided by the U.S. Department of Commerce through its Economic Development Administration. Federal funds allow the MGRC to assist local communities with economic development initiatives. Other federal agencies provide funds to the MGRC on an ad hoc basis as various contracts for services are executed or grant funds are awarded. Overall, the approximate funding ratio for the MGRC is as follows: (1) 35% state funds; (2) 39% federal funds; and, (3) 26% local dues. What services are provided by the MGRC? The MGRC provides technical assistance services to the communities of Middle Georgia in the areas of planning, economic development, public administration, information technology, and aging services. Please refer to the Services section for more detailed information. Also, browse the Annual Report section for detailed information regarding the services provided in each of these areas on a historic basis. What is the procedure for requesting technical assistance from the MGRC? Contact the MGRC to discuss the potential request and determine if staff can provide the services needed. If so, draft a technical assistance request letter and have the Mayor or County Commission Chairperson sign it. Please include the nature of the request and the name of the contact person the MGRC will work with in completing the request, as well as any deadlines, if applicable. The following week, please call and confirm receipt of your request. Requests are reviewed by staff, and submitted to the MGRC governing Council for approval at the next scheduled board meeting. Upon approval, MGRC staff will begin work on the request, working closely with the contact person provided. Upon completion, MGRC staff will mail a transmittal letter to the Mayor or County Commission Chairperson stating that the request has been completed. Can the public request information from the MGRC? Yes. The MGRC, as an organization identified by Section 50-18-70 of the Georgia Code (OCGA), adheres to the proper release and disclosure of public information to the public. Please refer to the Georgia Open Records Act for more information regarding the procedures followed by the MGRC to release public information. If filing a request under the Georgia Open Records Act, please contact Jen Doran, Open Records Officer (jdoran@mg-rc.org) or Kim Stanton, Secondary Records Officer (kstanton@mg-rc.org). How do I contact the MGRC?